I've talked a lot about my gray hair on here. It's kind of been a big part of my life, since deciding to grow it out a year and a half ago. I'm not going to lie, there are many days, maybe even everyday, that I feel a twinge of nostalgia or even sadness for my old, brown hair. I also have a year-and-a-half invested in this whole growing out stuff. Too much to go back on right now. Finally I guess, there is something satisfying about not having to worry about dying your hair, about being "authentic". Being the real me. Once again, I'm writing more than I intended. This latest post on my hair is really just for the people who have been asking for an update on how the growing out process has been going. There isn't a ton to report, and actually, I need to get a real "update" photo. It's been a long road, but my advice would be, if you really feel ready, just jump in and go for it! Over time, my reaction to regular hair dye became more pronounced. I've since learned that this is quite common with the additive, PPD. I had to stop using conventional dye, and switched to henna. One day, about a month in, an older man who worked at the front desk at the sports club that we visit, made a joke about my three colored hair. Something like that. He was right, it was white, red, and brown. I was so embarrassed, that the next day, I decided to chop it all off. I LOVED having short hair. It was SO MUCH fun! And boy was it nice to just get up and go in the morning. No long blow-drying sessions. I'm a girlie-girl at heart though, and I never felt right or pretty. I know I had to keep trying to grow my hair. I was sad, and sometimes dramatic. SO EMO! And one day it started to look a BIT less unusual. Kind of. And today, this is me, Which really means nothing because I am wearing a hat. Ha! I'll need to take a better update, but basically my hair is like the photo above, only a little longer. I like the gray- you're stylish and beautiful, you can pull it off! And it's great to set the example of just being yourself and loving even things about yourself that are "flaws." You hair is AMAZING! I bet when people stare they are thinking just that. Also, you don't look any older now then when it was brown. It looks better this way, in my opinion. I'm 38 and growing my gray out. You are such an inspiration! So... What products do you use? Do you blow it out, of is it naturally straight? Let's see....Well, most of the time I blow dry my hair straight. I find that it helps my hair to be a bit less frizzy and a little shinier. That said, it's naturally wavy/curly, and sometimes I let it air dry. When it air dries, it's much softer! I've been trying out a few different gray/white specific shampoos. What do you use Rebecca!? I'm ALWAYS looking for advice! So far, the best brightening shampoo and conditioner that I have come across is Clairol Shimmer Lights. But..this is a big but....I really really try to stay away from as many chemicals as possible. I haven't used a regular, non-organic/non-paraben shampoo in such a long time. With my white hair though, now I need to use special shampoos to keep it from yellowing. It's a balancing act I suppose. I try not to go overboard with worry... Shimmer Lights has a strong smell that I don't care for, so I have also tried Pantene Silver Expressions. It's been just fine, but still, not natural enough for my preference. I did try a paraben-free shampoo for gray hair from Whole Foods! Nice product, just not as good at taking out the yellow as the others did. I would love to try Phyto Phytargent Whitening Shampoo next. It's natural and looks great...but, it's $18./bottle! Yikes! If I do end up taking the plunge and buying it, I can let everyone know how it does. As far as other products have gone, it's not easy to find light, natural styling products. I've been using the Garnier style Pure Clean line. They are made without some of the harsh chemicals and seem light. I put a cream on when my hair is wet to cut back on frizz. I like their line! Have you tried rinses like Roux's Fanci-full White Minx rinse? It sounds funny and ridiculous to me, even typing this....but, I've heard that many stylists swear that it makes your white or gray hair shiny and bright. That's the scoop on all of that! I would LOVE to hear how your "growing out" is going, and what you use too! What has it been like for you? Do you get encouraging remarks, or do people ask you why? Thank you bunches Rebecca, I really appreciate your comment. Have a great day! Believe me, I've seen some women out there before me, growing their grays and inspiring ME! Thanks so much though. Good luck on your "growing out" if/when you start. Let me know how it's going. Thank you for such an amazing answer! Your hair is beautiful, and I imagined there were all kind of fancy products and secrets involved:-) I guess you just hit the genetic jackpot. Right now, I only have about an inch of gray. Unfortunately, I keep on throwing in the towel and coloring it. Lame, I know. I have had a few slight reactions, though, and I'm now a bit worried. Anyway, I've been using lots of mainstream products, so perhaps I should heed your advice and try that Garnier line. Great idea! I wish I had styling tips to offer, but I don't. Well, except that I have wavy hair, and I've found the wrap method of drying works well - is super fast. Thanks so much again for answering! I'm thinking you are inspiring quite a few of us out there. Hi Rebecca! Happy early New Year! Thank you so so much for another sweet and encouraging comment. You words really do mean so much. Oh gosh, and also, it is not lame AT ALL to try to grow out your grays, and then to go back to dying. Not at all! Really, this is such a difficult thing to do when you see that little "skunk stripe". MOST people throw in the towel, I sure did many times! Be kind to yourself. You know, the only reason I was finally successful was because I almost had to stop. My allergic reactions were getting worse each time I used dye. I had read that this is how it often works. I just had to stop, the headaches were too much. So....I had a real helping "push" to stick with it the last time. Thank you so much again for the thoughtful comment Rebecca. So nice to meet you! Lauren, I'm 37 and my hair has been steadily growing white since I was 18. Used to love it—grew in 2 shocks on the left and right side of my forehead like lightening bolts. But now it's a whole mess at the the top of my head and just about everywhere else except the base of my head. I spent New Years in Hawaii and resolved to feel as young as possible (as I am!) every moment on the road to 40 and to color my hair for a little psychosomatic boost. Though I've been wary of the orange henna can wreak on those with lots of white I wanted to try it since it was natural. Anyhoots, long story short and a yellow test strip later (ak!) I stumbled on your post. I'm so glad I did. Thanks for documenting your journey—you've rekindled my brave! Per shampoo, I noticed curls in your 1st pic... I'm curly and have fallen in love with Deva products: NoPoo, and One Condition have changed how I wash, condition and dry my hair (wrap with jersey/old Tees rather than towels with loops). They're sulfate-free, my hair has never looked healthier. Happy New Year! Ah yes....the road to 40.... I COMPLETELY understand your desires for a little psychosomatic boost with henna. I really do. In honesty, not a week has gone by that I did not think to myself: "Gosh, maybe I should color my hair, I want to start looking younger, not older"! But, that said, I'm SO glad that you didn't end up with a bunch of yellow streaks because your "Lightning bolts" sound SO COOL!!!!! I love it! If I had to guess, your lighting bolts might be one of your most interesting and awesome characteristic. (I imagine you have a whole slew of them), but if you stop and think, do you get a lot of compliments on your gray? For me, it's easy to forget that people comment much more on my gray, then say....why make-up or my new shoes. Also, maybe re-thinking the color boost.....I have this idea, and I promise to document it if I go through with it! Instead of dying my hair, I was thinking of getting a conditioning glaze put on. 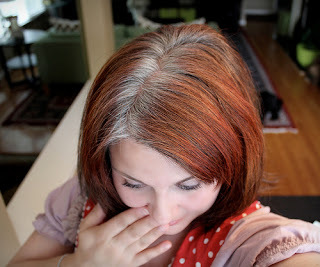 My hairdresser mentioned that she has a special glaze that helps to make your grays look light and bright and glowing! Doesn't that sound interesting? It literally makes your grays sparkle. I really need to check that out! So, you or or I could add some color, but perhaps we just have to imagine the color being enhancing rather than covering. Deva!!!!! Thank you so so much for your advice about the Deva products. You have me VERY intrigued and inspired! Since that photo was taken, the one where I have curly hair, my hair has changed a bit. Especially after the birth of my son, my hair went from very curly to less curly, more messy curls. Also, the white hair has a more wild, frizzy texture. So, I tend to wear my hair straight, in "hopes" of looking more polished. Also, can I just tell you how many people I have heard say, that they LOVE their NoPoo and other Deva products? So many! I even have a friend who is a trained Deva stylist. Her curly cuts always look amazing. P.S. I am formulating a "Best of Tips and Tricks for Growing Out Your Gray" post. I promise to post it as soon as I can. Thanks for making my day. Have a lovely Monday! Oh I found the Pixie shot! You are simply gorgeous. I cannot say it enough. Your hair suits you in every photo and I love the pic with the cat! I hope I can 'do' grey as well as you do. You and hair look beautiful. I had been going gray since 6th grade and last year finally took the plunge in March 2012 and started to let my grow out. I took a different way by getting heavy blonde highlighting so that it would blend easier. Now I just have a few tips with blond left but waiting for it to get longer because I also do not want to have short hair. I still have moments that I feel like I am adjusting but it does give you a new sense of freedom from the coloring. I also plan on trying the White Minx rinse to see how if it brightens the gray even more and going to try a natural alternative to remove some yellowing that occurs with the gray. You (and your hair!) are gorgeous. I applaud what you've done. Thank you for starting this blog. I started growing my hair out last year and then dyed it due to insecurity! But I decided to overcome that and start over... So sad to think it could have been so much further along by no. I'm 37 and i love silver hair! It's so stylish and classy and transcends all styles and time. I'm so happy that finally someone in our age group took the plunge and documented it all to help the rest of us. I also use diva products, it's been 5 years and they are awesome. I wanted to. Tell you that I saw a young woman this weekend who had silver hair walking in my town of skaneateles and I could stop staring and smiling at her! I'm sure I made her uncomfortable but it was just so gorgeous I couldn't help myself! So next time some one stares at you just think of the admiration and appreciation that person must have for your courage and dedication. I also started an Instagram called greyhairdivas recently to help me along, I post pictures of women with grey hair that I find online! Please tag us with one of yours. It's so nice to meet you. Thank you for stopping by and for the comment. Yay! Another silver sister in her 30's! I'm glad that this little blog could be a bit of help. I'm just like you, I was looking for other 30-something. And now we've met! Ahhhhh, Deva products. They're so nice. I'm still experimenting with different brands for my hair type/color, but I know, Deva are super. I have a family member that swears by them! I enjoyed your story about spotting another young person with gray hair on the street. That's so funny. Never be afraid (may you're not) of going up and saying to a gray-haired person and saying those nice things. I always feel so honored when somebody stops me and says something nice. Especially on the days when I'm feeling "blah" from the grays. I'll look for you in Instagram! Cool!!! Thanks so much again Yasmin!!! you look way too young to have grey hair! I'm also a 35 yr old silver sister. Dyed my hair to cover my unwanted tones all my life. First it was to cover reddish tones, then it was to cover greys. Found my first grey at 14. In my 30s I couldn't dye my hair often enough and I was self conscious about my silver roots when I noticed people sneaking peeks. I was inspired by a gorgeous coworker who was a year younger than me with natural grey hair. Before meeting her, the only examples of grey haired women were in their 60s. I was a slave to the hair dye because of this. When I'd dye my hair at home and rinse it out, I'd notice lots of hair loss. I knew the bleaching agent wasn't good for my hair and I started noticing allergic reactions to those color depositing shampoos I was trying to use instead. So I bit the bullet and grew it out. I can relate to you about the ugly phase. It was so contrasting against my dyed black hair. But I began to see the cool silver highlights. I had wanted highlights before but never got the right effect. Nature's version was what I dreamed of. Anyways the dye is all grown out and I get complimented all the time. If I had known it was going to be like this, I would have done it a long time ago! 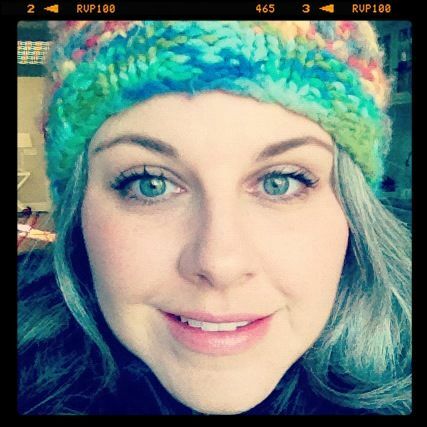 Thanks for sharing your story and you are proof that natural grey hair doesn't age you. This was beautiful and inspiring. Thank you so much for sharing. I think I'm right behind you in the adventure of revealing the gray. Dear Adriana and Anonymous commenter - THANK YOU!!!! I hope you both have a lovely week. Thank you for coming by!!! Absolutely inspiring! At 37, after dying my hair at least monthly since I've been about 21, I threw in the towel. I'm 6+ weeks since my last dye now, and though I have a pretty funky skunk stripe going on, your blogs have me looking forward to the day once it's grown out. Thank you! Thank you of much for your comment! Oh wow! GO YOU!!!! You've been dying your grays for 20 years and have decided to give it up! That's amazing. That takes courage! I'm commending you, that's not easy. I'm soooo glad that you love what you're seeing so far. I would bet with each week and each month that goes by, you'll love your grays even more. So many hugs to you too! Nice to meet you Laura!!! I LOVE your hair! You are beautiful. I have been struggling with embracing my grays.... you are a true inspiration! Thank you for sharing your story! I think that you are so beautiful with that gray hair! I think I will do the same. I am tired of trying to look "young." If you're ready, I'm here cheering you on! Whatever is right for YOU is the best route. Sending you lots of cheer and encouragement! Thank you so much again. Your gray hair is quite beautiful and looks wonderful on you! I began graying in my early twenties, and by the time I really began noticing it, I had already been coloring my hair for fun for several years. That transitioned so seamlessly into doing it to cover the gray that I don't remember making a conscious decision to do so. But my hair grows quite fast, and in the last few years, the struggle to keep up with the increasingly gray roots has left me frustrated. I'm now 43, and I realized back in the fall that the time between appointments meant I was spending literally half of my life dissatisfied with my hair color, and that seemed like a ridiculous way to live. So I decided to stop covering the gray starting in January 2014. As part of the process, I have searched the internet for positive gray-haired role models, which is how I came across your blog. While Helen Mirren, Emmy Lou Harris, Jamie Lee Curtis, and such women are stunningly beautiful, it was wonderful to see a younger person embracing and enjoying their gray hair and looking even more striking than with their dyed hair. I have only an inch of gray growth right now, so it hasn't been unusually painful yet. I am perhaps foolishly optimistic that with my newly short 'do, it won't take too long for the old color to grow off. My confidence has been bolstered by your story, and I hope my head of gray hair will look as lovely as yours! Hi Lauren, I'm about two months into my grey hair journey and I really appreciate your blog. 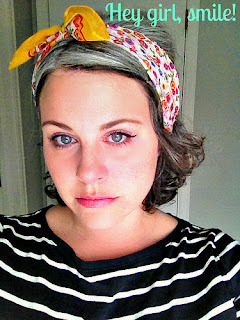 I'm 35, and it's hard to find many examples of women in their 30s going grey. I have shoulder-length curly brown hair, and I've stopped coloring it, though I am doing highlights to help blend the line of roots. I'm definitely noticing dry hair, and since I have oily skin, I have to watch out for oily roots. I'm having good luck with a bit of coconut oil on the lower half of my hair before I apply styling products, and that really helps with moisture. Anyway, I just wanted to thank you for writing about your hair so honestly. You are beautiful and I think your main blog photo is stunning. I hope my hair will look as good as yours when this is all said and done. I have been growing out my gray/white hair for two months now. I tried at first to use demi-permanent to make the transition, but in my hair it just left an orange band—which still hasn’t quite washed out. This has been a ridiculously difficult transition, one which I’ve been thinking about for years- to be exact-for the last five years when every two weeks my roots would appear and I would cringe, try to resist the urge to dye, then cave and buy some color. And every time I would color, I would feel like a fraud. Every time. Not that anyone else cared or noticed or called me out on the dyed hair. But I noticed. I was hiding from myself, feeling guilty for my grays and then consequently for covering them. I began to realize that I was becoming neurotic about my hair -of all things. At home in front of the mirror I would just stare at my halo trying to quantify the individual strands, and at the salon I couldn’t bear to even look at my reflection until the process was over. After the dye, I would have about a week and a half of relief before I would start fixating again. Then I would use the cover ups- essentially painting my head. Every time I would leave the house in bright sunlight I would think – can anyone see my roots? What can they see? Did I cover everything? And this isn’t any way to live. I realized this neurosis both was and wasn’t about hair. Hair had become the symbol of my mental state. I was so depressed and didn’t want anyone to know. The gray was the me I couldn’t face. I’m 35 and the whole front half of my head is almost white and somehow I convinced myself this was a personal failure. Were I stop the dyeing that would mean I wasn’t trying to look my best, to fit in, were I to keep coloring, that I was always lying just to blend in …I couldn’t win either way. Finally, I had enough. I started growing out my hair over Christmas break. I went home and basically hung out with my family and stayed indoors so I didn’t have to see the world- or rather let the world see me. In the last few weeks, I have cut my hair four times- twice on my own and have had a professional fix it both times. When I got back last week after vacation, I laid out all my dyeing supplies on the counter, looked at my reflection, and then I just couldn’t go through with it. I put everything away again under the sink. I knew if I colored my hair I would be back in the same spot two weeks from now. And all this progress would have been for nothing. To ease the transition, my hairdresser gave me a spray (brown) to apply. But I couldn’t do that either. Instead, I went back to class with my new short haircut and my gray on display with bobby pins pushing back the hair from my face. I found that this actually was the best look for me– and after hours of mirror time I figured I was the expert in this particular case. That’s not to say that walking around in public thus exposed has been easy. I feel nauseous a lot of the time, but that feeling is starting to fade. I’m beginning to feel the release. I had been allowing hair to control my mood, and dictate the days I could go out. I know the process will keep getting better. For me, queen of negativity, that’s a radically different outlook (since when I would color my hair, the countdown would start…to the moment when the real color or lack of color started to come back). Now I can actually look forward. Your blog is wonderful. I am grateful to have found it. People can say it’s just hair- what’s the big deal? But you, and I and all who read and comment herein know that for a myriad of reasons…it is a big deal. So thank you so much for putting your story out there. I know you helped me. Hi Lauren, I'm Amy nice to meet you! Hi Lauren, Thanks so much for sharing so much of your journey. You and your silver are so beautiful and so encouraging. I' m two months into my journey and suddenly I'm losing courage and just want to hide. Todayit just looks ugly to me. However, I have no desire to color anymore so, I guess I'll just hope this awkward stage passes and focus on other things. It has taken a seismic shift in consciousness just to get this inch of growth. Hey fellow Michigan girl (I'm in Livonia)! I just wanted to let you know how encouraging & inspiring you are!! When you decide to go natural, you truly can feel alone. I was thrilled to find your website! I too think your hair is beautiful & I'm actually looking forward to seeing mine grown out. Going to do a shorter cut in summer, but then let it grow longer again. The dye has bothered me for years and the affects did get worse as time went on, plus doing it at home started to give me darker spots (I got the "3 colors" comment too and I wasn't even showing roots!!). After last month of sitting at the salon for 2 long hours, the smell, the expense, the sick feeling for 2 days- I said enough! Your tips are great. Had to laugh at the "hair shadow", I've used brown eye shadow to cover roots for years in between coloring! Thanks so much for sharing it all. Hi Lauren, your hair is absolutely lovely and really suits. I am 42 and have a lot of gray that I still colour. I started to grow my gray hair out at 37 after an allergic reaction and fed up with orange henna hair...your hair is so like mine, even my coloured hair looks the way yours used to. However, At the time, my husband disapproved, he told me that I was letting myself go and didn't like my gray look, even though he himself had started to go gray and I was/am sporty, fun, kind and a good mum. I stopped, but what he said was the proverbial straw. A few years down the track I am divorced and enjoying life again. If I ever partner up again in the future he will be one to support me going gray, that is a requisite! :) with love, from Australia. Oooooooh my gosh! Your comment had me wide-eyed in so many ways! First, thank you, thank you for sharing your story with us! I'm so glad that you're here! Second, I am incredibly sorry about not receiving your very deserved support from your ex-husband the divorce that followed. As I was reading your comment, before I came to the end, I was thinking HOW IN THE WORLD could an (ex) husband say such things when hair dye could literally cause you a life threatening allergic reaction!? Also, I'm SURE, your husband saw what a struggle and mess henna was. I am deeply sorry, we all deserve understanding and support form our partners, especially when dealing with things that can be dangerous, and/or issues as easy as a simple color of hair! Also, your hair DOES sound just like mine! So glad to hear that you are enjoying life now. Much much love to you in Australia!!!! You look absolutely amazing and are such an inspiration to me. I've been dying my hair since my early thirties and I'm 40 now and taking the plunge. I've only got about an inch of gray growth but it feel so pronounced and already I was questioning my commitment when I found your site and I'm determined to stay patient and only hope my gray hair will look as amazing as yours! You're at the 1" mark, and what I can tell you if once you get past this beginning stage, everything become MUCH MUCH easier. It's a breeze once you get going! Please hang in there. I promise you, if you stick it out, you will be so so happy with the new you! I know how hard it must be right now. We're here for you, myself included, happy to give support. I love the Facebook group "Gray & Proud." If you're on FB, you might want to consider joining. They've helped me a lot. Thank you for your kind words Kristen, and for sharing your story. Thinking of you!!! You can do it!!! I really see how this might not work for everyone...many people would just look unkempt and judged by others to be in need badly of a "touch up" but your face is truly beautiful and the grey of your hair brings out your eyes! I can appreciate all the help you ave put out to others for this difficult and often "feeling ugly" transition! Thank you for your kind words and your honesty. It's amazing how gray can come in looking so different on everybody. I suppose it's just kind of the "luck of the draw" to see if one's gray will really suit them or not. The difficult thing is for those who must stop dying their hair because of serious allergies. They're kind of forced to just live with what they have. I hope that I can help even just a bit, to ease them through this. God bless you! All the best! Remember to keep your eye on the end goal when the going gets tough Anita. That made such a difference for me. It's all so so worth it in the end. I bet you look gorgeous too! I'm so happy to have found your blog!! I've been dyeing my hair since I was 20 just for the fun of it, but due to the dye aggravating my genetic hairloss, I decided to return to my long forgotten natural color. Color me surprised to find more than a few strands of gray hair after my temp color (to ease the transition) washed out. I freaked and almost dyed it. Not for my vanity, mind you, as that was another reason to stop coloring it. No, I was thinking about my very young son. My husband's whole family went gray very young. He was completely gray by 20. I guess I worried about my son going off to school in a few years with old looking parents. Thank you for strengthening my resolve!! My son was about five years old, the first time I tried to grow out my gray. It works out. People know from your face that you're not in your 60's or 70's....a more "traditional" gray age. Thank you for all of your kind words Leah! Thinking of you and sending cheer your way!!! I just made the decision yesterday to stop dyeing my hair. I cancelled my next hair appointment and took a deep breath as I went over the decision over and over again in my head and then I stumbled upon your blog, Boy has it made me feel better. I am 38 and started getting white hairs when I was about 30, I'd been coloring my hair on and off since I was a teenager though, mostly because I liked to experiment with color. After I had my 3rd baby, at 33, I began coloring a bit more routinely because I noticed more and more white/gray roots showing..freaked me the heck out lol. Now though, I am so tired of being a slave to the hair salon, going every 4 weeks for touch ups and refreshing, it just has become so annoying..not to mention expensive! Plus my husband hates when I color my hair..he wants me to be as natural as I can be. Your blog has made me feel a lot better about my decision, so thank you very much for sharing :) You have truly inspired me and now I am a little bit excited to see what my hair is going to reveal to me as the color fades away. I hope I have the courage to see this through..I sure am going to try! Thank you so much for stopping by and sharing your story. If it was difficult for me to find the time to color my roots every month having only one child, I can just imagine how much trickier it would be with three children! I understand what you're saying about being tied to the salon and everything that comes with it. Here's the cool thing about growing out your gray, if you don't like it, you can simply go back to coloring your hair! You're not bound to anything, but I bet you'll love the freedom of not having to touch up your roots, just like me! It really has been great. It's not easy to be young with gray hair, but there's definitely lots of perks. Thank you for your kind comment. I am very excited for you! Please hang in there. The beginning of this process can be difficult, but there are so many great things that come from the freedom of not having to always use hair dye! Hello Lauren, I am so glad to find your blog and read all of the comments. I decided to stop colouring my hair in August last year. At first I tried low lights, which only helped me cope for about a week. So then I decided to have my hairdresser pull some highlights through the crown area, sort of an effor to soften the near black to white transition line. I had hoped that it would be two or three months of highlights then freedom. Not as easy as that with a hairdresser involved. But I haven't gone back to the dark colour either, because it made me break out and it left me with a dark halo on my skin for days. I am happy to say I have gotten away with a toner for the last two appointments and now have quite a bit of hair that is naturally silver. I do treat my hair to a deep condition every week, both to help it stay healthy with the highlights as well as due to the fact that it is curly. I told my mom my plan to stop colouring my hair, expecting her to be the biggest protestor. Happily she was all in favour and very encouraging. I am only 43 but have been avidly colouring to cover the grey since I was 30. I am so glad to be going natural with the colour as I have been embracing the texture since my early 20s. Now I am not happy with the highlights and wish I had been brave like some of the other commenters because by this point I would be nearly done. In any case the back of my head is all natural and I love the way it feels and looks. Now for the rest to finish growing out. My skin is so much healthier without the dye going into my skin and hair. I feel better than I have in years, and bonus for not having to waste so much time in the beauty salon every month! Thank you for being so candid here, I am glad to have found you. It's so wonderful to meet you. Thank you for sharing your story with us. I'm glad to hear that in the end, you're loving your natural hair, especially in the back. And, I'm happy that you feel great! I know, it can be so so difficult to pluck up the courage to show the world your gray. Many people have been helped by slowly transitioning with the highlights and lowlights. But.... at least in my case, and similarly sounding to yours, the reaction to the dye just gets to be too much! Please hang in there, it goes quicker than you'd expect. Thank you again for stopping by and for you nice comment. So glad that you're here! P.S. You might have already seen this, but there is a tab at the top of this page that says: "GOING GRAY? HOORAY!" If you click there, all of my other gray hair posts are listed. So much luck to you Candace!!! Thank you again for sharing with us!!! Hi Lauren, I'm 35 & found my first gray hair at 18. I have some very white hair (around my face) some more salt & pepper, and the rest is my natural dark blonde. Colouring it light brown is a monthly routine I'm really over. I've been considering going blonde, but then thought- why pay a fortune to a salon when I have naturally light/highlighted hair? I stumbled across your blog, and it's given me so much positive inspiration & ideas for growing out my old colour. I can't guarantee that I'll do it, I'm impatient with my hair & I can see myself reaching for the dye at some point, but I'm excited to see what my white & silver curls could look like! So much luck to you Janet. Just follow your hear on this stuff and I promise, everything will work out! Sending you cheer from Michigan! today I had an interesting conversation happening on my FB page about the decision to grow out my hair and be a-la-natural and embrace my gray, I have two very strong grey streaks at the temples of my head and a gray band that bridges the two. I started graying at 15 but when I endured a months hospitalisation having gone prematurely into labour with my first born daughter at 20 weeks and the 4 weeks that followed before her death, I literally went white from the stress. Getting back to the conversation a "friend" commented that I shouldn't grow it out and let myself go and suggested that doing so would show that I didn't care to look after myself .. I was watching the Matrix during this FB conversation and had an epiphany ........ ""I can't really explain it but, I try really hard to raise my girls to look for beauty within, Ask Shae what makes a person beautiful she'll tell you its your heart. I want my girls to look beyond a physical, I wan tthem to know that health and vitality, good food and exercise make a body strong - not strive for a perfect weight ......... that laughing keeps us youthful, that aging is natural and something to be celebrated, not fought against, trying to remain looking as youthful as possible for as long as possible, rather than accepting our aging body and embracing the wisdom that comes with age, the lines and wrinkles show that we have lived - I want to be strong and beautiful and model by example ........ grey hair and all My girls won't look at me and say "gee mum, dye your hair, you look old" as if that is a bad thing ...... I want them to look at me and say " I love you mum" and not see age, just their mother"
A real friend posted your blog to my comments and thought I could draw upon your experience as inspiration - embracin gyour natural gray and going against the grain is scary, but I know it will be liberating. I am also 3 months in to growing my hair out from pixie cut boy short so I know at least for the next 5-9 months I am going to loathe the way I look (have been boy short to waist length more times than I care to count). Thank you for your blog, I actually cried reading it. You are breathtakingly beautiful too. First, I am so very sorry to hear about the heartbreaking story of your first daughter. I can not imagine the loss and what you went through at such a tender age. It is no wonder that you began to gray then. So many things for a young person to deal with at once. You sound incredibly resilient and wise and brave from your comment, and I was in awe reading about all of the FANTASTIC things that you would like to teach your daughters about "true" beauty and aging. Your words resonated with me so, and I think that you are setting your children up with incredible strength and understanding of what is truly important in this world. I know it is a bit more complicated than this, but in the end, it's just a color, and what matters most is not a color, but love and life and family and friends. Three months into your transition is a BIG start! So much cheer and BRAVO! being sent your way! Wow, it sounds like you cut a lot of your hair off too! I love your spirit of just jumping in! I promise, these months will soon be in the past, they really will. And then, you'll be left with a happy, healthy, beautiful head of new hair! It gets so much easier, I promise. Oh! By the way, I am guessing you saw this tab, but there is a tab at the top of my homepage that says "Going Gray? HOORAY!" 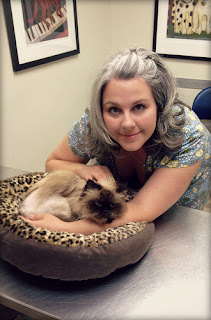 If you click there, it will take you to a page that lists all of my gray hair and gray hair transitioning related posts. I hope they can help a little! Thank you so so much for your kind words Naomi, and for taking the time to share your story. My heart is going out to you as I hope you find lots of support in this whole hair thing from friends and family as time goes on. Thank you for reminding me also, all of the great things that being a woman and being your best is about! OK, I have to admit that I have never posted on any board, but this means a lot to me, so here I go. I turned 40 in March and well, I've decided to take the plunge and go grey. 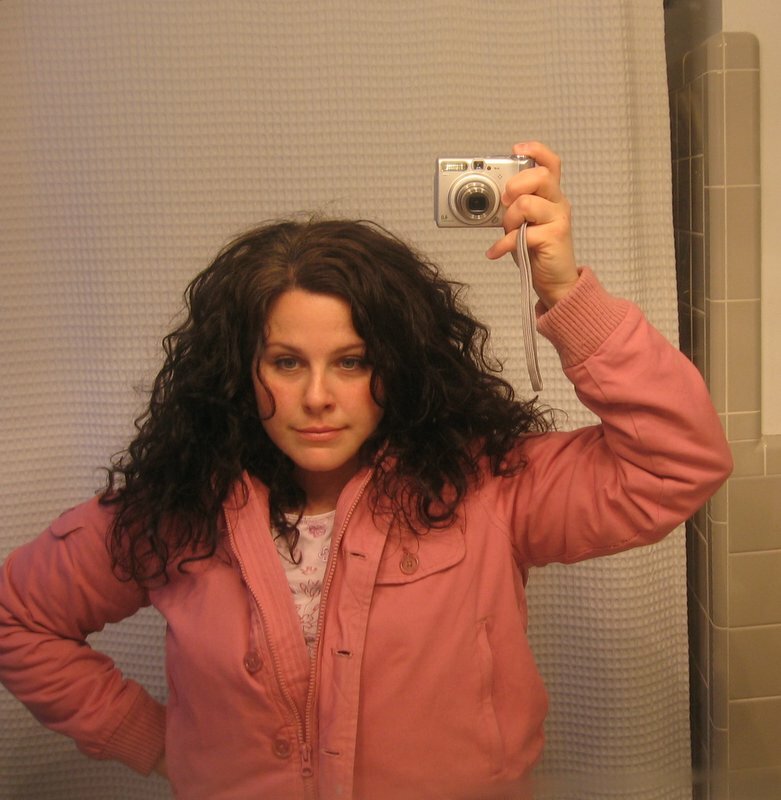 I noticed my first grey hair when I was 16 and have been dying my dark brown hair since I was 33. I decided that before my 4oth birthday party was going to be the last time I dyed my hair. I haven't dyed it in 6 months and the "dividing line" is striking and I must admit, awesome! I just saw a picture of myself and I think it looks GREAT! I find myself looking in the mirror and loving the way it is coming it. Granted, I'm sort of dreading the really obvious growing out stage, but I guess I will just deal with it. Lauren, it is yours and others pictures and blog that have only reassured me that this is the right decision. You look FABULOUS and you can pull if off, too! It is about time we truly love who we are, grey and all. I can't help but look at all the lovely ladies who have embraced their grey and see women who have truly embraced their authentic, amazing selves. I will post my pic once the transition is all done. Thank you for your blog and post and thanks for being such an inspiration! You are AMAZING!!!! First, thank you so so much for taking the time to stop and to write me, and for all of the super supportive and kind things that you said. It takes courage to leave a comment! I don't often do it myself on other boards because I'm nervous that what I'll say will sound strange. So, thank you for making this post your first comment! Dear my new "anonymous friend" who has also had her fair share of henna experience just like me! I'm so so glad that you've stopped by to share your story, and I can't thank you enough for your sweet comment and for letting me know that How Bourgeois was able to help. That made my day! It was a turning point, like: "Hey, this won't last forever, I'm ready to get through this as fast as I can, and meet my NEW ME!" 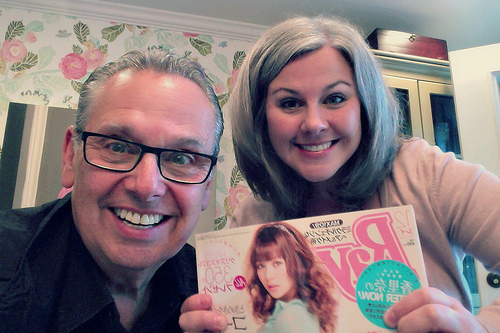 So, I found a super sweet hairstylist who supported my gray plan. Then I had her cut off much of my red henna hair. It was difficult for me to have a short haircut, as I prefer myself with long hair, but it was fun to style, and something about getting much of the "third" hair color off helped a ton! And gosh, you are so right. I loved what you said about the people who count don't care what color your hair is. <3 They care about YOU being happy and healthy! So much love and cheer is being sent your way. You can do this! Thank you again. Please come back and let me know how you are doing!!! Hi my new friend Ali !!!!!! My gosh Ali, my heart is just going out to you after reading that you had TWELVE inches of hair cut off in February. Oh my, that would have been traumatic for me too. You are brave, you are stronger than you know! Ali power! I feel as though, at a certain point, it was my short hair which bothered me more than the salt and pepper. But on the other hand, I had the same goal as you do, to kind of be done with the henna. There is no right or wrong, so even if you don't find a short haircut that you love, and you don't cut anymore length, one day your henna will be all grown out. It happens either way! Thank you for writing Ali. I'm so happy to meet a new silver friend! Come by and visit anytime! Hi Lauren - I am so happy I found your site! You are absolutely stunning and when I saw your picture on the main page I said, "That's how I want my hair!!" I just cut 10 inches off because I decided for my 39th birthday to go ahead and start growing out my gray. I don't have so much - a little on top and quite a bit at the temples, so I think it will take me longer than a year or so to grow it out. Do you recommend cutting it shorter and shorter until there is an even amount of gray? I am concerned because I work in an office and want to maintain a professional appearance. Lots of congrats on your new journey for your 39th. It can be a rocky road to get there, but there are so many great things that come from growing out your natural color. I think you will love the freedom! You have a great question as to whether or not you should cut your hair short and short as your gray comes in, to make everything more even looking. It sounds like you have a bit of gray on the top and on your temple. You might always have just a touch of gray, or it may all come in quickly like mine over a matter of a few years, or like others, it might take decades. You never know what you'll get, but it keeps things fun. My personal opinion is that this is a SUPER personal choice. Some women just feel BLAH with short hair and that might make you feel worse than the gray. On the other hand, many many women have fun with funky, short haircuts and enjoy the new style for a while! It just depends on what your heart says to you. Also, poke around online to see women mid-transition. You might want to take stock of the different looks while growing out your gray....long hair vs. short. For me, something about cutting my dyed hair off and having the short hair, made me feel like I was making progress more quickly, and that my roots did not have as many ends to contrast with. 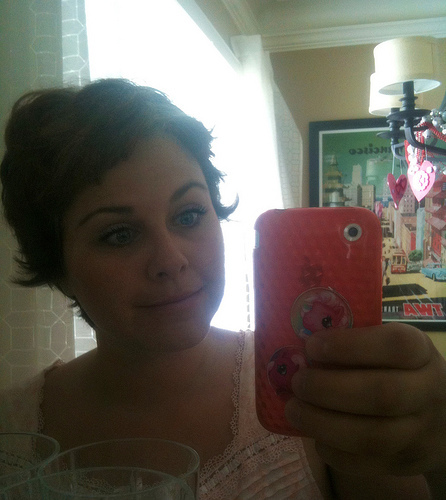 I ended up not loving myself with short hair for the long-run, but it was ok and fun for the time being. As far as being professional goes....Hmmmm. I do tend to feel that shorter cuts, or even streamlined bobs look very professional. But then again, more than the cut, it's the stylist! That's a good thing to do, get on the same page as your hairstylist, and if you can't find one that you love and trust. So much luck to you. Thank you for your wonderfully kind comment and great question. I hope I answered it ok. Please let me know if you have any other questions at all! I am so excited that I have found your blog!!!! Thank you for your true words of wisdom sharing your story and encouraging others! I've been slowly turning grey since I was 16 or 17, and that is when I started dying my hair! I just couldn't bring myself to have grey hair that young. I've always had self-image issues and struggle daily. that being said, I've been everything from brown/blonde/red, to just red, red/blonde, black, you name it, i've probably tried it, lol. This year, I turn 30. although, deep inside, I am TERRIFIED, I am also a bit excited! to step out of my comfort zone, to not be that "20-year old" cliche anymore. I've always been told I have an old soul yet I look so young. Well of course that had me thinking, re-evaluating myself, why I continue to hate how God made me. and then today after drying my hair...there it stared at me again... thats when I ran across your blog on pinterest! SO THANK YOU THANK YOU THANK YOU! I think I may be finally ready to embrace my age, embrace myself and embrace my grey hair! Oh Laura, that is such a double-whammy, turning 30 + deciding to take the plunge and go gray... You just hang in there, ok? (>'-')> It all works out, I promise! Also, the same goes for gray hair! TERRIFYING right!? ACK! But really, really, really, once you get past the hard bits of the growing out phase, there are soooooooo many great things! :) Like a neat new color, super healthy hair, no root touch ups, freedom!!! What journey too. You learn a lot about yourself! Sorry that I'm rambling Laura! I'm glad that you're here. Thank so much again for sharing and for you super nice comment. I'm sending you heaps of luck and cheer your way! Keep us posted!!! A couple of things come to mind after reading your comment. One thing is, is that it's FANTASTIC that your husband is being supportive. You know what? That is a HUGE help. I don't know if I could have grown out my hair, without my husband's encouragement. So you lean on him, ok! Also, of gosh, please don't worry about a short haircut. You don't need to get one! You have to do what works well for uniquely you! There are no rules. Keep your hair long, I understand! In fact, after I cut my hair short during my transition, at one point, it was the short cut that bothered me more than the gray! We all deal with this differently, and that's ok! I also have a white hair/dark brown mix. Yeah, there is a big contrast like you mentioned. One thing you could do is have your hair lightened and then have highlights and lowlights woven in to blend the line between dyed hair and your gray. All of that said, I just wanted to get away from the chemicals in the hair dye and just went for it. I figured highlight/lowlights or not, it would all take the same amount of time. It was great because I was left with the healthiest hair that I've had since I was a kid! I'm sending so much luck yo you Traci. If the time is right for you, you can do it! I'll be thinking of you. Nice to met you and thanks again for sharing! I apologize greatly. What I think happened, is that I unintentionally hit the tiny "delete" button, which is next to the tiny "publish" button. I am very sorry. I then went to my email and found your comment notification and realized that I could publish your comment that way. Which I did, but for some strange reason, it only published your name, not your comment. Please know how sorry I am, and also how much I appreciate your comment and your story! Thank you for your encouragement. I am so sorry again and promise to be more careful next time! Please take care and wear that beautiful head of hair proudly. I can't believe I came across your blog! I've been saying (jokingly- sort of) that I am so sick of dyeing my hair and am just going to let it go gray already! My problem is my gray seems like it's patchy. Was yours at first? I don't know if I have the guts to chop it all off, my hair is so fine and thin, it looks horrible short, ZERO body. Just flat and lifeless. 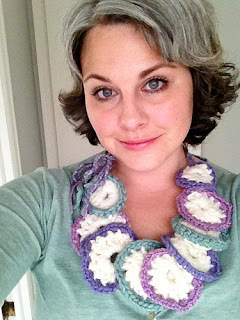 I'm just so glad I found this blog and that some people are embracing the gray and you look fabulous. I wish I could just fast forward! Thank you! Thanks for writing in. If you really feel ready for this, go for it, and if not, that's ok too! When my gray was growing in, it wasn't super patchy, but that said, I had been getting gray hair for about ten years, so I had nearly a decade to grow it less patchy, which I'm sure it was in the beginning. Thanks again for writing and welcome!!! Your blog is great, not only the gray-hair stuff but also the posts about your everyday life. Bringing the former house owner Ann flowers – so inspiring! And hey... guess what?! We are bedclothes sister ;-))) I have the same one – the one with the roses (Is bedclothes even the right word? Sorry, English is not my first language, so there may be some grammatical mistakes.) Btw, guessing from your interior, I think you would absolutely love England. I’ve always wanted to visit and last year I finally did a one-week tour with a friend and we loved it so much. The people there are really nice, the castles/mansions/gardens /B&Bs are so beautiful and the food is absolutely not bad at all :-) You should really go – there is so much to see. Thanks so much for sharing your “Gray-Story”, you are gorgeous - inside and outside. Your blog has definitely helped me that I should accept my grays and growing out is an option. When I was approx. 23/24 years old, a friend found my “first” gray hair. I eventually started dying. Now - at 30 – I switched to henna/indigo since I hated all the chemicals on my hair. In addition, my already frizzy hair is really, really dry. Uggh, the indigo is so stinky when getting wet (really “great” during work-out/sport, probably casting-out all the other people ;-)) but for now I am happy that I found an alternative. My grays are still quite scattered and I am a single lady at the moment so I think I should wait a little while until growing out. But you definitely inspired me that I should once try and see what lies underneath all that dye. Awww, Susi! \('-')/ Hi Susi, it's so nice to meet you!!! So you have the same nightgown? Do you also LOVE the warm flannel fabric like I do? It's the best, my favorite! I always thought it smelled like mud. Although, I do think, even if it smells, henna and indigo are very good things. It's nice that they can color hair without the chemicals! Oh! And yes! Yes! I would LOVE to visit the english countryside. The trip you took sounds WONDERFUL!!! I'm glad that you had such a nice visit. I have been to London and just outside London, but never to the countryside. You are right, I would really like to go. I hope someday I can! Thank you for writing, it is great to meet you! I feel like I have a new friend. I hope you're having a lovely week Susi!!! So great hearing from you, hope you had a lovely week, too! We actually had snow on Thursday for the first time this winter, I was shocked. Not much snow, but still...there are still summer tires on my car!!! Oh no, I picked the wrong word :D I actually meant bed sheets. Mine has the same pattern/design as yours (I got it from the big Swedish furniture store with the 4 letters ;)). Funny that our stories are quite similar. Does early graying run in your family? I just noticed this summer that my grays must have multiplied the past year and was really sad. Before that I honestly haven’t given a thought that I might be totally gray before 40. I struggled accepting it, but hey...it’s just hair color, isn’t it? 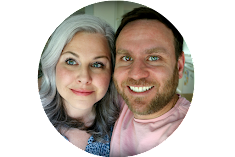 The thing is –having hair that grows very fast and is quite dry - I don’t like the prospect of dying my hair the next 10-20 years so I found it very helpful seeing examples of how others rock their grays and don’t hide them. Internet is such a nice invention ;) Besides, being able to communicate over thousands of km apart is kind of great! And yes, Henna/Indigo are awesome, my scalp is so much better! Loved your last blog entry! I drive a little Mini Cooper, so as you might imagine, it is not the best in the snow. I feel like I am sledding in my car. Yes, gray hair does run early in my family on my father's side. For example, my brother is 35 and his is turning gray, although not as quickly as I am . How about you? Does it run in your family? To be honest, my gray hair began to come in much much more quickly after I had my son. I'm not sure if it was hormones, or something like that. I think though, since becoming a mother, I just felt more tired and my life was more busy and stressful than before. I wonder if it made my gray start to come in quicker and quicker? I think it is just a "feeling" you get when you are ready to try. And, the best part is, you can someday try the gray, and if you don't like it, you can instantly go back to indigo! No problem! I love that we can communicate from around the world too. I agree, it's so great! Thank you for stopping by to say "hello" Susi! You made me smile. Awwwwww. *blush* . Merci beaucoup!!! I really love your hair, Lauren. You look great! At 31, I have a few grey hairs, but have vowed never to colour my hair. I believe natural is beautiful. THANK YOU! Such a sweet comment. Thank you for writing. I'm glad that you're here! I'm glad that you're here!!! Today I found your blog and have to say, it feels great to read about someone who is going through the same thing and is someone we can all relate to! I know I'll be coming here for reminders about why I'm on this journey... but I love knowing I'm NOT ALONE! Thank you so much!!! My roots are about 12 weeks in, and I had a box of dye ready to go... but I returned it today. I'm going for it. I know this decision can be an emotional roller coaster at times, and I've yet to meet anyone who loves their hair during the transition phase, but once you get going, (which 12 weeks is awesome!) it'll just get easier with each day!!!! And, it sounds like you have an AMAZING gray goddess role model in your MOM!!! How FABULOUS!!! :) I love that. I'm so glad that you're here C. Please know you're not alone in this and if you have any questions, I'm here for ya! Thanks again for stopping by. I loved reading your story. I'm just stepping on to the 'Can I do it ?' train too. I will read your blog to keep the faith! Hi Ciara!!!! It's wonderful to meet you!!! Thank you for your kind words. I just read your lovely post and yes! Yes! I completely related to everything that you said. You put it so well! I had the exact same feeling and experiences too with that constant gray hair root touch-up. What I can say is that for all the struggle as I went through the dreaded "grow out phase", afterwards, the freedom from hair dye has been soooooooo worth it. :) And, I can't believe it but I actually like my gray hair. Thanks for stopping by Ciara. If you need some gray hair cheer, I'm always here! A few years ago, my mother became tremendously ill. It was, like, overnight, I started getting white hair (about 55+), never had a gray hair before! I work as a professor at a college where, of course, my students are much younger than me. I really want to relate and connect with them. I have been working many years now, as I was promoted to an administrator. But, because I have been there through many stages of my life, I don't want to appear old or out-dated in relating to faculty or students. All of my former professor colleges are more than 20+ years younger than me now. I so much want to embrace my gray-white hair. I let it go 9 weeks this summer (while hiking in the UK) and my hair looked dreadful when I came home and I actually tried to style my hair after letting it be in a ponytail for all those weeks. I didn't 't care when I was away, but when I came back to my professional responsibilities, I was so embarrassed to look like that professionally (really the actual skunk look). So, I went back to the dye. Now, it seems I need touch ups every 3-4 weeks (and that is pushing it!). Plus, the cost for a salon touch-up (which seems to really only work for me as it becomes increasingly harder to cover) is just getting too expensive for me as I look to saving for retirement. I really, really just want to quit this on-going expense. But, I just now looked at myself in the bathroom mirror (post 5 weeks, and I absolutely hate what I see!). How did all of you women handle this in a professional atmosphere during that gruesome stage growing out stage (and from the pictures I have seen, look so great or have such a positive attitude?). I feel like I need to take two years of vacation to do this in the privacy of my own home and space! Thanks for any helpful comments or support. I am considering taking the plunge on stopping the hair dye merry go round. I will be 47 in January and have been coloring since my early 20s. My first gray hair popped up around the time I turned 16. So I have been coloring for at least 25 years. I don't even know what my hair looks like anymore. I am nervous and excited about this new venture. I think I will go very short in order to spare myself a little of the growing out agony. I have already let my stylist know I wanted to break the color cycle. He suggested lowlights and a short pixie cut. Crossing my fingers it looks even half as beautiful as your grey hair. I am a 39 year old Aussie who has been going ungracefully grey since hitting my 30's much to the amusement of my children and the shock of my friends and colleagues when I tell them I have been dying my hair for almost 10 years now. I knew exactly what I was in for with my Mum going grey/white in her early 30's and in an attempt to cover it trialled a myriad of colours until finally settling on natures intention and allowing her beautiful white to shine through. I have for the last couple of years started dreading the 3-4 hour visits (thanks to my super thick hair)at the salon every 5 weeks to cover my patchy white/greys and ensure the skunk stripe does not get out of hand. However I am noticing each time that there are more and more to cover and now I am at the stage where I've had enough and thinking of letting nature do its thing. I am due to go to the salon today and was looking at best ways to grow out my colour and that's where I found your blog :) which has given me the inspiration and courage to just go for it. Thanks for this. I'm in the process of growing out and your words and images really helped. You're lovely, btw.